VMware has done a good job of providing administrators ways to keep their ESXi deployments up to date – both with offline bundles and with VMware Update Manager for patching the ESXi systems. Either method is pretty simple and HP leverages these same tools for its custom vibs. For HP, administrators should point to http://vibsdepot.hp.com for the latest and most up to date information about the correct recipe of VMware and HP tools and driver versions. This is also the repository for automated updates that can be plugged directly into VMware Update Manager – or can be manually downloaded and loaded into Update Manager or used as offline bundles. Why not just deploy VMware’s default ESXi? Some administrators adopted the HP customized ESXi image early and others have held out until the latest ProLiant Gen8 hardware was released. The latest ProLiants need storage and network controller drivers included in the customized HP ESXi image to successfully deploy ESXi on Gen8. So now, a growing community has deployed additional HP utilities into their ESXi as well. In my own experience, that’s not been an issue, however I did hit a problem a couple months back where excessive logging from one HP tool filled up my ESXi RAMdisk. Filling the RAMdisk made the system unmanageable even though the VM’s continued to operate on the host. So like any other software, you need to patch those drivers, tools and utilities from HP if they’re present in your ESXi. 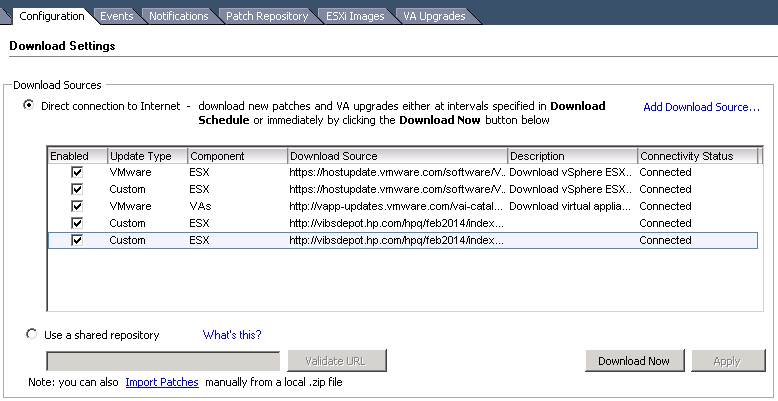 As mentioned earlier, the HP updates are deployed using the same VMware provided tools as all other ESXi patches. Administrators can use VMware Update Manager for a more automated deployment, ESXCLI for command line or scripted installations or they can use Image Builder tools to package the HP vibs into images that they are creating for deployment. Since I’m primarily focusing on patching, Update Manager and ESXCLI would be our two go-to tools. For Update Manager, the easiest way to get the HP updates into Update Manager and onto hosts is to point to a new repository in the Update Manager tool. Adding an additional repository in Update Manager must be done through the Configuration tab of the Update Manager settings using the traditional Windows vSphere Client. It doesn’t appear to be configurable in the vSphere Web Client. Navigate to Solutions and Applications and choose Update Manager. On the Configuration tab, under Settings, click Download Settings. In the Download Sources pane, select Direct connection to Internet. In the Add Download Source window, type the new download source URL. For the HP repository, the URL will be http://vibsdepot.hp.com/hpq//index.xml. Tip: You may navigate to http://vibsdepot.hp.com/hpq/ to see a directory list of all the release dates. Click Validate URL to verify that the URL is accessible. Once you have setup the custom repository, click Download and let those updates be imported into Update Manager. Once imported, rescan your hosts and now the HP customized tools will also be remediated during patching. Alternatively, you can download the individual zip files of the updates from the http://vibsdepot.hp.com website and import the individual updates into your local Update Manager library. Once imported, make sure these updates are included in a baseline and attached to a host and rescan the host. The new patches will show up and you’ll be able to remediate the hosts with these patches. Just replace the in the URL with a correct release date to point to an active repository. With both Update Manager and ESXCLI, keep in mind that you’ve configured and/or remediated against a single, point-in-time HP repository, so you will also need to add new repositories as the patches change and new updates are released from HP. You may navigate to http://vibsdepot.hp.com/hpq/ to see a directory list of all the release dates. Configuring against a single release is the recommended HP method to ensure you get the correct patches according to the recipe for your ESXi patch level. HP also releases a list of recipes for which version of tools and drivers work with which version of ESXi and its patch levels. These recipes give administrators additional validation that the tools loaded have been tested with the ESXi patch level and everything should run correctly together. The recipes are available on the same site with the patches and downloads at http://vibsdepot.hp.com. The PDF recipes highlight more than just the software aspect of the ESXi and HP tool integration – it also highlights the firmware levels desired by ProLiant make and model to ensure that everything has been tested together. Philip is a IT solutions engineer working for AmWINS Group, Inc., a specialty wholesale insurance brokerage based in Charlotte, NC. With a focus on data center technologies, he has built a career helping his customers and his employers deploy better IT solutions to solve their problems. Philip holds certifications in VMware and Microsoft technologies and he is a technical jack of all trades that is passionate about IT infrastructure and all things Apple. He's a part-time blogger and author here at Techazine.com. View and opinions are my own and not reflective of my employer. Check out Philip's new book, PowerCLI Cookbook with more than 75 how-to recipes for using PowerCLI in real-world environments. Its great for beginners and more advanced PowerCLI scripters. The views and opinions written on this site are my own. Reader trust is extremely important to me. I accept products and trips sponsored by vendors for the purpose of give-aways and information to post on this blog site, however, any vendor relationships will be disclosed to readers. Ads are used in the sidebar, header and footer to help offset the costs of maintaining the site.